Some colors work very well this way and some do not. Part 1 of this color exploration. I’m studying using Cyan, Magenta, Yellow and Black to make dye colors. Think CMYK color printing percentages. Some of my samples as I work on particular colorways. The oranges and blue were from a different colorway. 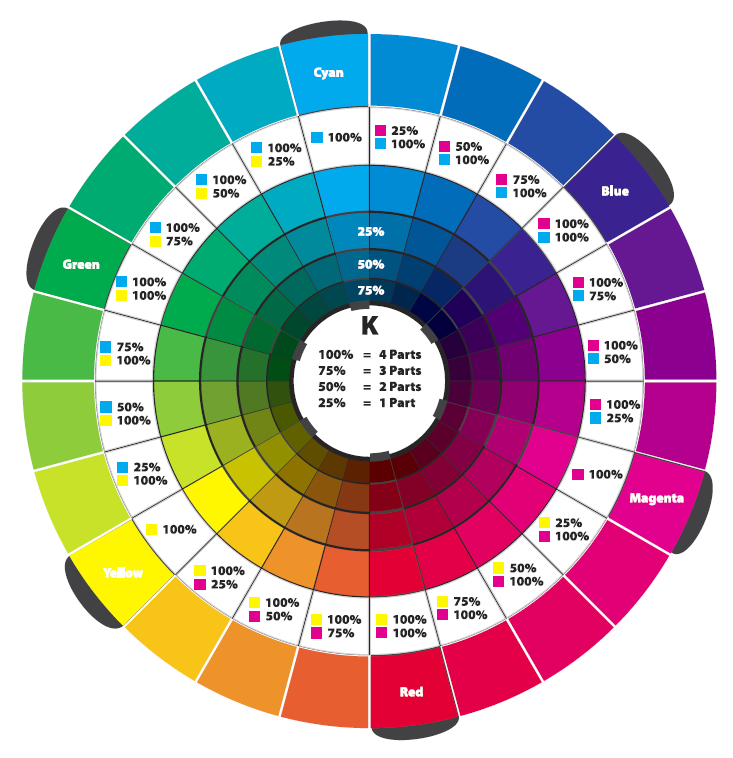 If you’re not familiar with CMYK its from modern color theory (using cyan, magenta, yellow and black – instead of red, green and yellow) and I’ll get into that more in a later post. 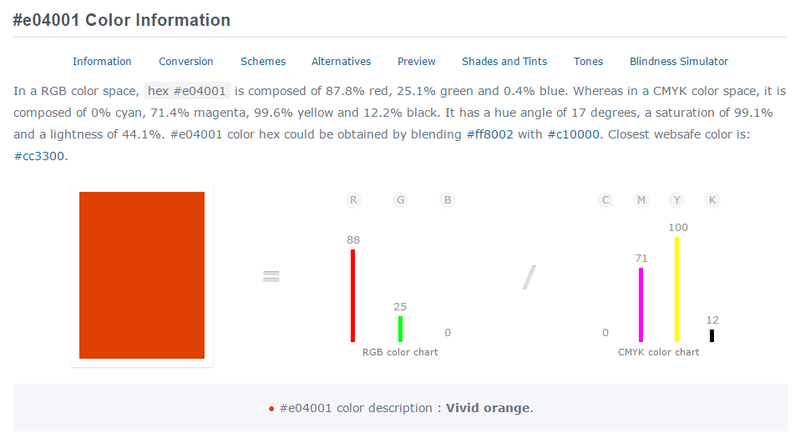 Using this color below for an example: (info from colorhexa.com) It has 0% cyan, 71% magenta, 100% yellow and 12% black. Not totaling the percentages for the color, but how much of each color you’d use out of a possible 100%. 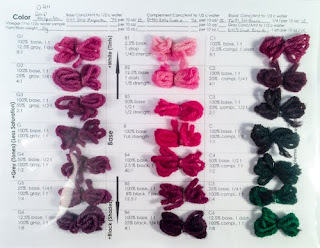 Say 1 teaspoon dye stock is 100%. 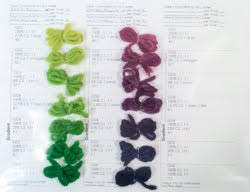 Then for this color 71% would be about ¾ of a teaspoon of dye stock. 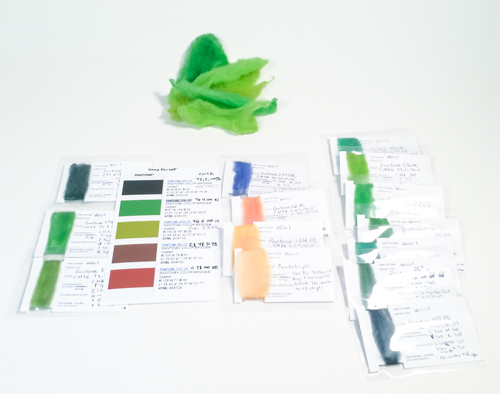 Figuring out how to measure very small amounts of dye stock so I don’t waste it. (I found some very cool measuring spoons with a drop, dash, smidgen, etc. Who knew these were real measurements? I had to measure them against a teaspoon because I’d seen differing opinions on the measurements of the really small ones.) Helpful for reproducibility. Figuring out how to quickly adjust the color of a sample mix. Having 5-6 samples to tinker with at a time and a paper to note what you added each time is helpful. Color conversion is very much an art and not an exact science. Photoshop and say colorhexa.com have different “recipes” for CMYK. I think this has to do with “color spaces” (adobe rgb, vs srgb, etc.) which are a heavy graphics topic. 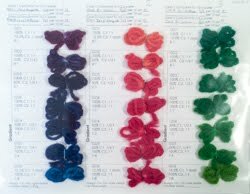 Not sure how much I want to dive into graphics terminology when I’d rather be playing with dyes. So there’s your preview. I’ll have more pictures, details, and hopefully more success with browns next time I report in. I’ve only seen two other bloggers attempting this but not in as much detail as I’m trying. Have you played with using CMYK for mixing your colors? If so, would you care to care to share your results?